In a move that further proves that Associate countries have entered an era of professionalisation, the Netherlands board has given a boost to the country's players by handing out central contracts for the first time. 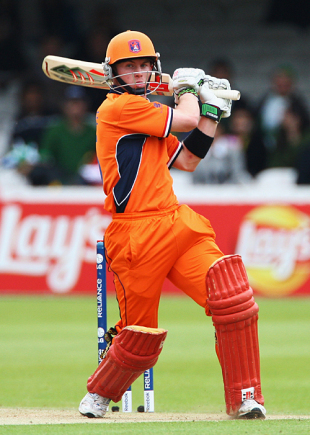 The decision, taken with the aid of funding from the ICC's High Performance Programme ahead of the World Twenty20 Qualifier tournament next month, allows the Netherlands players the much-needed opportunity to juggle their careers while attempting to maintain or launch their international careers. Three players - the captain Peter Borren, Tom de Grooth and Eric Szwarczynski - have been awarded full-time contracts. Ryan Ten Doeschate and Alexei Kervezee and signed Category B contracts, or county player agreements, while the remainder of the squad have all signed part-time player agreements due to their commitments elsewhere either with jobs or emerging professional careers. The legspinner Daan van Bunge was also offered a professional contract but opted for a part-time one owing to his intended career aspirations outside cricket. The problem for Associates has been balancing their professional careers with other issues, such training after working a full day and having to take time off work to go on tours. This radical decision has now made it far easier for the Netherlands players to manage their careers. "We have different categories of contracts, so that there are options and opportunities for those in careers, those playing county cricket in the UK, and those not established yet or emerging," said Richard Cox, the Netherlands board chief executive. "The contracts are also designed to be flexible to allow some to progress full-time with their cricket and coaching whilst others will be focused on their county commitments and careers in the Netherlands." According to Borren, this was a much needed necessary step in view of the full programme. "The Netherlands is now following other countries in professionalising the set-up," he said. "This way competing at the highest possible level becomes a step closer as the core of the team improves its cricket. We are looking forward to having more opportunity to devote time to the Netherlands team in a truly exciting 13 months for Dutch cricket." Said Peter Drinnen, the head coach: "It's another step forward in semi-professionalising the squad and in general the squad and I will benefit from full access to each other in training and preparation leading through to the World Cup." The World Twenty20 Qualifier tournament in Dubai and Abu Dubai between February 9 and 15 will see 17 matches take place, played at Abu Dhabi's Sheikh Zayed Cricket Stadium and the Dubai International Cricket Stadium at Dubai Sports City.